The death of a family member can bring up numerous questions and concerns, especially when it occurred as a result of someone else’s negligence. Not only are survivors left to handle the physical and psychological consequences of the death, they may also have to deal with the financial challenges brought on by a loss of income and support. When families are faced with the tragedy of an unexpected death, a wrongful death claim may provide much needed financial compensation. What is recoverable in a wrongful death case? Medical expenses. In situations where the victim received medical care prior to his or her death, the family may receive compensation to cover the treatment expenses. For example, a father is severely injured in a motorcycle accident. Doctors perform surgery in an attempt to save his life. After a week on life support, he succumbs to his injuries and dies. The family in this scenario is left with the medical bills brought on by his treatment and surgery. A wrongful death award could cover these medical expenses, along with funeral and burial costs. Loss of income. If the deceased was a financial contributor to the household, the surviving family members may be able to recover from the loss of future income resulting from the individual’s death. For instance, a single mother is killed in a building fire while at work. Her surviving children are left without the financial support she would have provided if still alive. A wrongful death award can provide the children with compensation for this monetary loss. 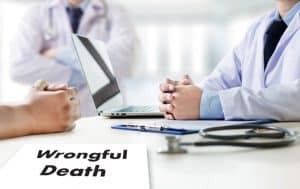 These types of claims can be complex and difficult to quantify without assistance from a knowledgeable Fort Lauderdale wrongful death attorney. Mental pain and suffering. Certain survivors may be able to secure compensation for the mental pain and suffering brought on by the death of their loved one. These awards often involve a claim for loss of companionship or, in the case of minor children, loss of parental guidance. to someone’s negligence. That is why we diligently work to provide your family with representation that is reliable, honest and skillful. Contact Yeboah Law Group to discuss the merits of your wrongful death claim. You can call us at 1-800-TELL-SAM or complete our contact form to schedule a free consultation.